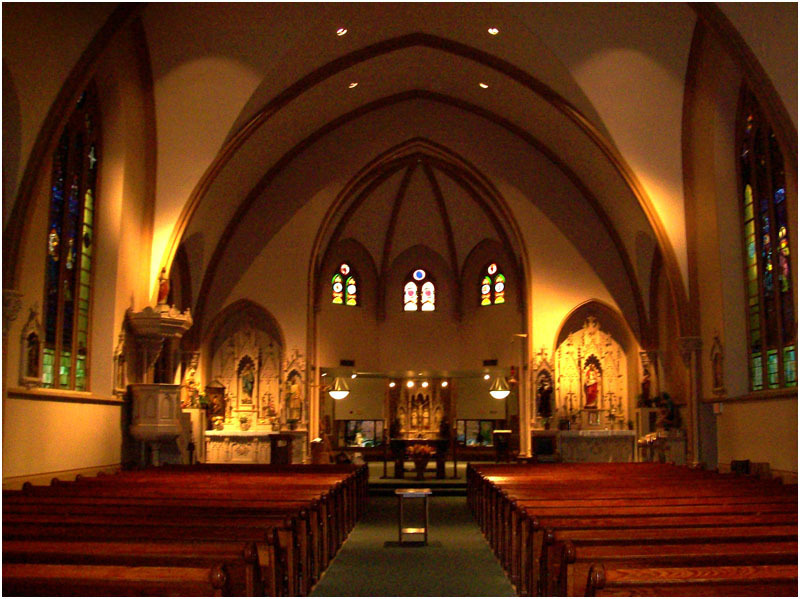 Under the excuse of “making more seating space” and keeping the old Cathedral building to pacify the “stubborn old-timers,” this Vatican II atrocity is truly one masterful deception. The Freemasons destroyed the altar and kept the old Cathedral side, but added on a new wing on the opposite side of the “altar”. This is so both halves of the building - the Traditional (old order) and Modernist Novus Ordo (New Order) could both face a Masonic Table. This is stunning if you understand what really happened here in 1977-8. Like any other Vatican II parish, St. Mary's is crumbling from within - the number of students is also plummeting dramatically under the “leadership” of a gambling, alcoholic administration. 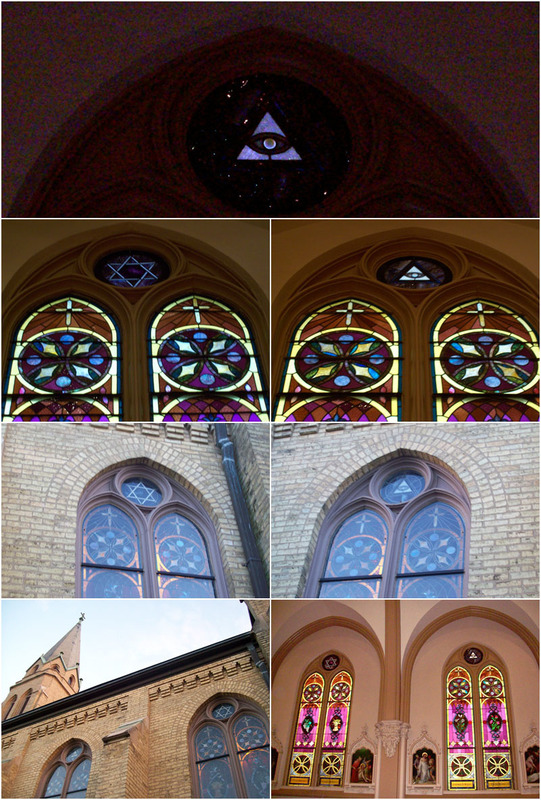 If you submit to this counter-church, you will one day find out that you were never baptized Catholic, and that you had been attending a Satanic Mass, designed by the Illuminati..
Pictured above are the incredible additions that were made to the stained glass window assemblies. The eye of Baal, the Star of David (you might recall the Jews crucified Christ) are now in the plain sight. These are NOT original to the building and it's plain for everyone to see. The Judeo-Masonic “sons of the devil” (encyclical by Pope Leo XIII) have clearly left their mark on this former Church. More da Vinci Masonic Jesus garbage which is easily disproven with the required texts. 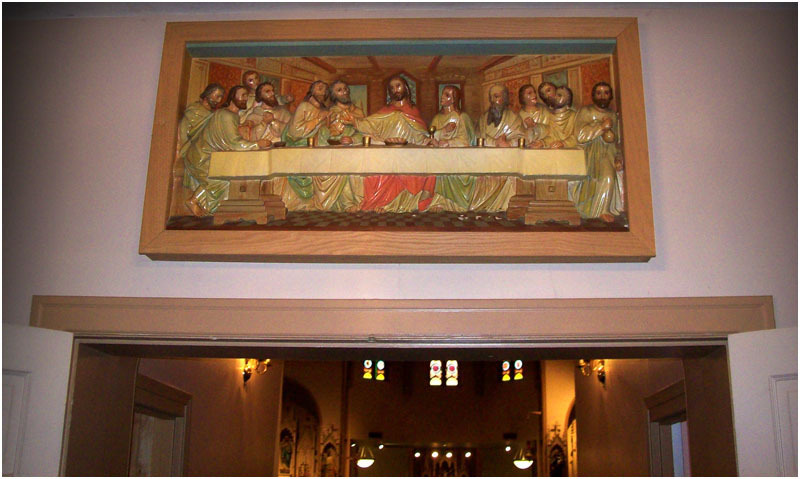 The Lord's Supper is not the Catholic Mass, it is Lutheran. This is why the altars were destroyed as an object of adoration and replaced by Bible worship in the 1960's. Nowhere, nowhere in the Bible does it say Jesus Christ is God, which is why the Bible does not belong in Catholic Churches..
”The devil has always managed to get rid of the Mass by means of the heretics, making them the precursors of the Antichrist who above all else, will manage to abolish, and in fact will succeed in abolishing, as punishment for the sins of men, the Holy Sacrifice of the altar, precisely as Daniel has predicted.” - St Alphonsus Liguori, “La Messa a l'Officio Strapazzati” in Opere Asctiche.